The Hoofing It In Oaxaca hike was high in the Sierra Norte. As always, the bus trip to and from the hike locations is part of the adventure! The bus began its climb on the valley floor at the town of Diaz Ordaz (elevation 5577 ft. or 1700 m.) and wound its way up the mountain roads, which began as pavement and later changed to hard-packed dirt. Valley view, looking back toward Díaz Ordaz. The hike began in the pueblo of Benito Juárez, elevation 9600 ft. or 2926 m. Benito Juárez is one of a group of mountain towns called Pueblos Mancomunados that work together to welcome visitors and provide information, guides, accommodations and activities for the enjoyment of their magnificent forested mountain-top environment. During the month of August many varieties of mushrooms are gathered in the area, and mushrooms in escabeche (kind of like spicy pickles) and other taste treats are available in the visitor center. We bought some yummy chocolate/mushroom balls that helped sustain us through the hike! I should have taken a photo before we ate them all. Welcome center in Benito Juárez. People farm the slopes, mostly growing corn for their own use. Corn is dried in the sun and then processed in different ways for making tortillas, hominy for pozole, or tamales. Photo taken by David. Leaving the pueblo of Benito Juárez, we admired spectacular vistas as we hiked along the ridge, then we trekked downhill through towering pine and fir forests, enjoying the cool shade and carpet of pine needles. Mountain Maguey. 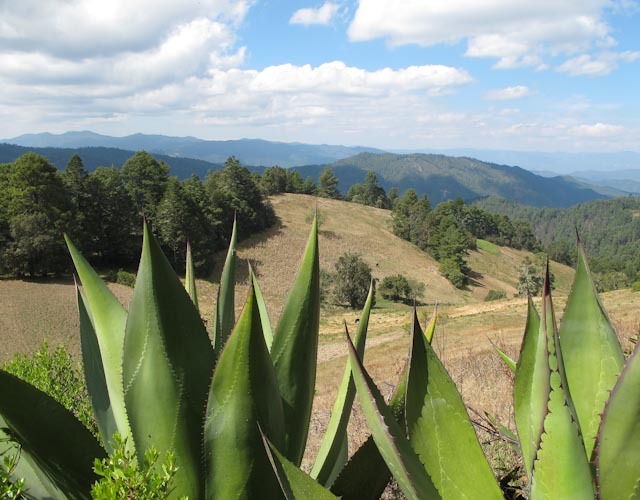 The maguey plants in these mountain regions are enormous! Stream Crossing. It was all uphill from here! Sierra Norte mountains near the pueblo of Benito Juarez. Valentin, our knowledgeable guide, taught us the names and medicinal uses of many plants. The creek crossing was at the bottom of a mountain, and the pueblo of La Neveria, our destination, was at the top. The trail was long and steep, but Valentin was quite considerate of our need to stop frequently so our pounding hearts could settle down! Benito Juárez in the distance. The cleared spot center right is Benito Juárez, the pueblo where we began the hike. Valentin was our excellent guide!